In preparation for a scheduled iCloud Drive launch with OS X 10.10 Yosemite later this fall, Apple added two new Web assets to the iCloud.com beta page, offering developers access to files, folders and documents stored using the upcoming service. 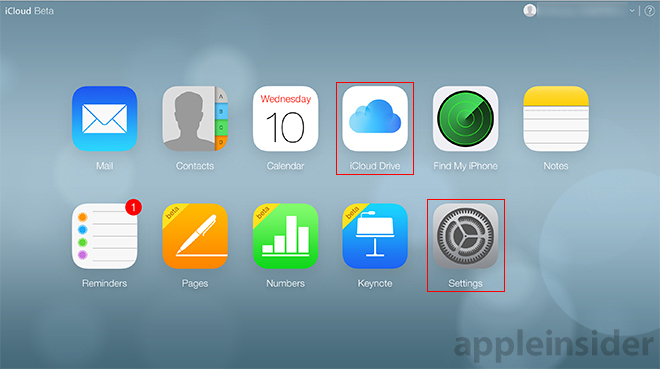 Announced at WWDC in June, iCloud Drive will let Mac, iOS and Windows users seamlessly transport files across platforms. In addition to storage and syncing, iCloud Drive also enables advanced features like document editing and asset tagging, along with drag-and-drop data management functionality. As for the Settings icon, the connected page contains user information, time and language settings, a list of registered devices connected to iCloud and a link to the Apple ID management site. An option to sign out a username from all browsers running iCloud.com is also included. With the current setup, this security feature is buried in an advanced settings menu. While the iCloud.com beta page offers no indication of public availability, the new Web features should roll out when Apple's iCloud Drive service goes live with the launch of OS X 10.10 Yosemite.